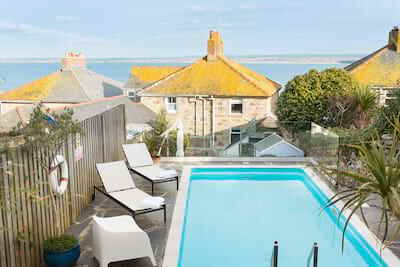 With a plum location in the heart of St Ives, Enys House offers a warm Cornish welcome and invites guests to check in and relax amidst the holiday highlife of this extra special home. The house is set over three floors and offers the perfect layout whatever the occasion. 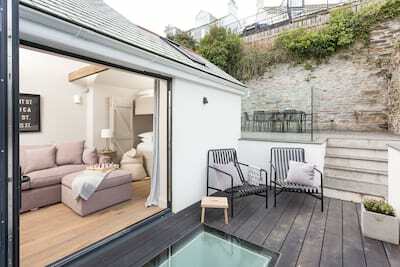 From sunny summer stays to winter weekends, a full house of 10 or smaller gatherings, soak up the space and light of this oh so stylish St Ives townhouse. 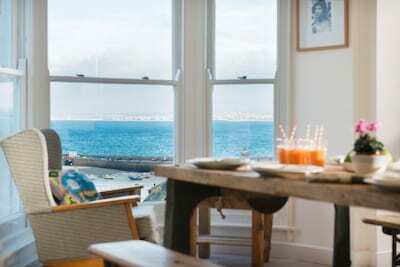 Guests can choose from five luxurious bedrooms including the tempting master bedroom with views across the blue bay of St Ives. A sea view terrace welcomes al fresco dining or wander from your holiday door to the harbour-side in moments where the Cornish heritage rubs shoulders with a more cosmopolitan coastal vibe. 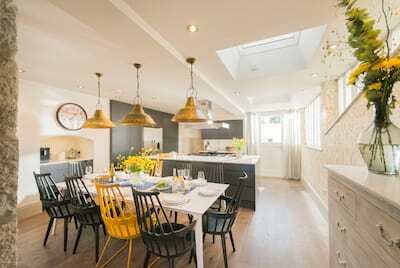 Enys House has been flawlessly renovated and interior designed to complement the existing period features yet add a welcoming fresh and inviting style just perfect for your holiday backdrop. With a sharp eye for luxurious and thoughtful design, the owners inspiration comes from a cool scaled back Scandinavian style with clean open spaces and neutral colour palette. The kitchen is certainly the hub to the house as guests gather around the large dining table for great Cornish food and good conversation. There are two living spaces in which to relax, children will enjoy the break out space of the smaller snug room whilst adults chit chat and relax in the larger room, beautifully dressed in soft shade fabrics and capturing the stunning sea views beyond. A utility room with rain shower completes the ground floor layout. The original period staircase ascends to the first floor and collection of four bedrooms and family bathroom. The final climb leads to the ensuite master bedroom with stunning sea views from your rain shower - a private sanctuary at the top of the house! The generous outside space ensures guests can make the most of the Cornish sunshine. To the front of the house is a sun trap terrace with built in seating inviting guests to enjoy breakfast al fresco, sundowner cocktails or simply soak up the views over a mornings coffee. To the rear is a walled decking area accessed from the road so the perfect place to de-sand and de-salt under the hot/cold rain shower. St Ives is just waiting to be explored! Wander through the traditional narrow streets to the harbour front and soak up the comings and goings of this unique and picture perfect coastal town. Stylish cafes open their doors for delicious breakfasts and hearty suppers, the eclectic galleries inspire with their landscapes of Cornwall and curio shops brim with souvenirs. Choose from 5 stunning beaches from Porthminster and Carbis Bay to the north and Porthmeor to the south with its clean waves and crystal clear waters. Boat trips around the bay offer a view of the coast from the water or try your hand at a plethora of watersports. Pack up the car and spend the day exploring West Cornwall from as far west as Land’s End, right up the coastline to Padstow in the north or Fowey to the south. Whether your time in St Ives is oh so short or you’ve a week to enjoy, check into Enys House and enjoy the luxury of the location. Bedroom two: First floor king bedded room. Bedroom four: First floor double bedded room. Bedroom five: First floor. A twin bedded room. Guests are invited to unload the car and access the house via the first floor terrace and through one of the bedrooms, there are 3 steps down from the road level to the first floor level. From the front of the house, there are approx 5 steps down to the garden seating area. The front of the house is terraced with 14 steps altogether, some with handrail. The master bedroom on the 2nd floor is within the eaves of the house with sloping ceiling within areas. There are two internal flight of stairs.